Dream 11 is been the most thrilling roller coaster to be on. India has made cricket to run in their mind and on their nerves. This has a journey for the fans to be as much near experience to this game. The team should be filled will spots of spinners and slow speed bowlers. Pitch is dry and rough and hard to get runs but the sensible and experienced batsman is needed to attain good scores. Try to keep the team balanced with spinner style bowlers and experienced yet energetic batsman. Jos Buttler (WK), David Warner, Steven Smith, Vijay Shankar, Krishnappa Gowtham, Shakib Al Hasan, Rashid Khan, Sandeep Sharma, Dhawal Kulkarni, Jofra Archer. This match is a thirst of a win for both the teams as neither had a good start in the IPL season. But the ball tends to go more in the court of Sunrisers Hyderabad because of pitch condition of the stadium. It appeals for the spinners and Sunrisers are full of bowling actions with their spinners slow speed bowlers and pacers. And one more advantage of the home ground and support of their spectators. 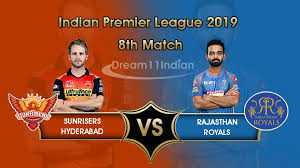 More likely Rajasthan Royals will be trying their level best to beat the opposite team on their home ground because Rajasthan Royals are not coming slow with their balanced team and spirit to win.